Status: Paired with Haribo 2015-2018. 2016: Made 1 nesting attempt which failed at egg stage. 2017: No nesting attempt was observed. 2018: Two breeding attempts – both failed at egg stage. Summer 2010: Black-Yellow is a good natured, medium ranking bird. She was a bit of a bully when younger but has calmed down now. She is an attractive bird, and has become one of the darker cranes. She has no siblings. September 2010: Black-yellow was initially quite often be found with Clarence's cohort of Clarence, Wendy, Gilbert, Gemma, and Michael, but has more recently been seen regularly alongside - but Minnies core group. 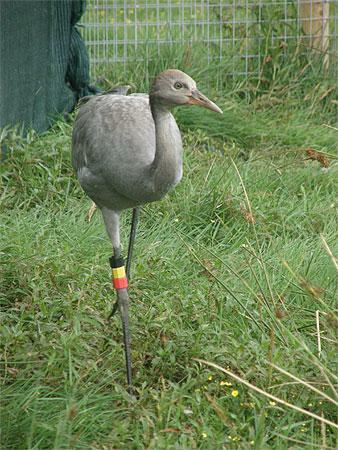 She is one of the birds fitted with a leg-mounted satelite transmitter and we can monitor her movements remotely. October 2010: Back to hanging around with Clarence's group again. Still one of the more quiet characters but an important part of the group. November 2010: In recent weeks the cranes have all joined forces with Clarences group and are now usually moving as a group of 20. They have found new fields to explore and are often found foraging on maize stubbles, Twinkle's new favourite food! Twinkle loves being part of this group and is often in the centre of the group and is never out alone. A very friendly crane! 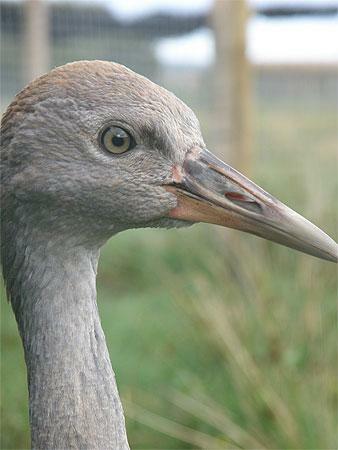 January 2011: Twinkle has been a steady member of the tight overwintering flock that the cranes seem to have formed - possibly in response to the cold weather. She has been regularly foraging on Aller Moor over one of the coldest winters in living memory. 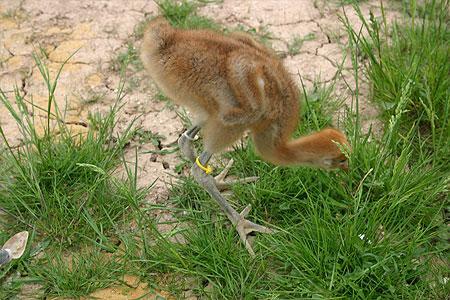 March 2011: Twinkle is still keeping her head down within the flock and is moulting out to become an atractive adult crane. Although the group is still largely together, she is quite independent so it will be interesting to see how she behaves as spring progresses and the groups break up. September 2011: Twinkle is now fully grown, and has most of her adult plumage. She is one of the most shy cranes, and tends to hang at the back of the group when approaching the youngsters or the costumed 'parents'. She is a little bit scruffy at the moment, but this will give way to her remaiing stunning adult plumage shortly. March 2012: Twinkle along with Squidgy and the wild, unringed bird went for a bit of a wander in mid March and disappeared for five days. As no sightings of her were received over those few days we will never know where she went! April 2013: Twinkle continues to thrive on the Levels - but is not part of any obvious pair - bond yet. July 2013: Twinkle underwent a full wing feather moult during June/July 2013 in Somerset and now has a new set of wing feathers. January 2014: She tried out her new wings in October 2013, being part of a small group that flew to Slimbridge and remained for 22 days along with Gemma and Mennis. Twinkle returned to Somerset, feeding with the main flock on Stan moor throughout the floods of Dec/Jan. She could be paired up with Minnie... but it's a bit early to say. Hopefully this will develop through the spring and we will find out more soon! July 2014: Twinkle exhibited quite a bad limp and odd gait through the winter of 2013/14, and plans were drawn up to attempt to catch her to see in case the problem is being caused by the leg-mounted tag that she is wearing. However, an appropriate opportunity never arose, and as spring 2014 came her condition seemed to improve. In February she also paired up with a 2012 male – Haribo and soon set up a territory on Westmoor near the village of Thorney where the pair were frequently seen and heard through the spring. No breeding attempt was made, however, possibly because the male is so young. The pair remained on Westmoor throughout the summer, moving back with the main flock in mid July 2014. Perhaps spring 2015 will see them have success. February 2016: Twinkle paired with Haribo again in the Spring of 2015 and spent a lot of time on Westmoor near the village of Thorney. However - no breeding attempt was made to the best of our knowledge. The pair joined the main Somerset flock for the winter of 2015/16 but early 2016 saw them both again on Westmoor holding their territory. Perhaps they'll be luckier this year. July 16: Set up territory on Westmoor, Somerset. Incubation started on 12th April, with two eggs laid. After 12 days the eggs were predated – probably by crows following a disturbance. There were no subsequent attempts.Nov 17: Set up territory on Westmoor, Somerset and remained in that territory for the season but no nesting attempt was observed. The area is liable to human activity (dog walking etc) and the pair were often disturbed. They have returned to the rest of the flock. Sept 2018: Seen quite often on West Moor in Jan, Feb & March. Incubation started on 2nd April whilst the moor was inundated with floodwater but the nest failed on 11th April as levels receded Only one of the pair seen feeding on Westmoor 27th April (likely start date for second nest) and a 2nd nest was observed on 30th April. Nest failed on 17th May – cause unknown but site had started to dry out. No further nesting attempts reported.